Mteta is a 33 year old horse who has been at the Horse Rehabilitation project in South Africa since his rescue in 2002. Mteta actually means “to talk” in Xhosa (one of the 11 national languages spoken in South Africa). 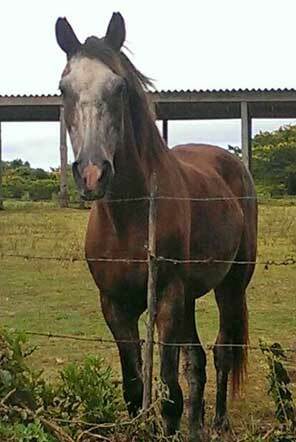 He was rescued along with eight other horses through the theft department in the Transkei region (over 350km from the project). Penny who manages the Horse Rehabilitation project actually used her 21st birthday money to pay for their transport to the project! There, he was well looked after her began to trust in humans through the help of the local team and volunteers. 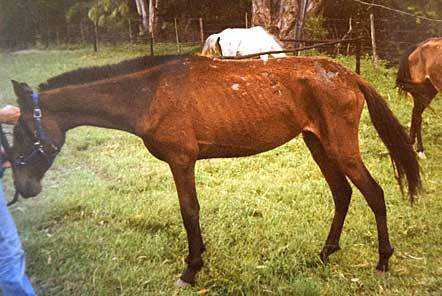 It can take horses like Mteta a long time to recover from their previous lives. He and the rest of the horses rescued on that day were in terrible condition, he had damage to his withers from ill-fitting tack and visible injuries to his vertebrae as he had no hair covering those regions. He and the other seven horses were also underweight. Mteta is one of the project’s success stories, he is now one of the trail horses which tourists ride and is one of the best horses for beginner riders and children. 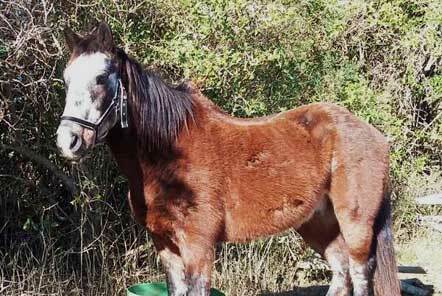 This is exactly what the project is all about, rescuing a horse that has previously been abused, injured or neglected and rehabilitating them, hopefully to a stage where they are able to become trail horses and they can help to generate income which allows the project to support other rescued horses – horses working for horses. This is the project’s fantastic sustainable approach to rescuing and rehabilitating horses in need! In his younger days Mteta used to have to be kept at the back of the group because he’d try to bit the other horses (even those who he got on well with in the fields), but he has mellowed with age and is now often referred to as a grumpy old man! As for the other seven horses which arrived with Mteta; Girlie remains firm friends with Mteta and is also a trail horse at the project, unfortunately Pegasus, Mattie and Peanuts went to the ‘paddock in the sky’ one due to Cushing’s disease and two due to old age. Storm went to a lovely home as a trail horse on a game farm, Timmy now belongs to a family with two young children that sadly lost their dad when they were just 8 and 11 years old and he helped them through that tough time a lot. Vicky is now owned by a young man who has cerebral palsy and they have helped each other a lot (as Vicky wasn’t always the nicest mare) and Imbi had to have an eye removed but then went to a really lovely farm not far from the project so Mteta and Girlie still get to see her occasionally.